The government will build a new system to monitor space debris by combining high-performance radar designed for defense and the space observation technology of the Japan Aerospace Exploration Agency (JAXA) starting this spring. 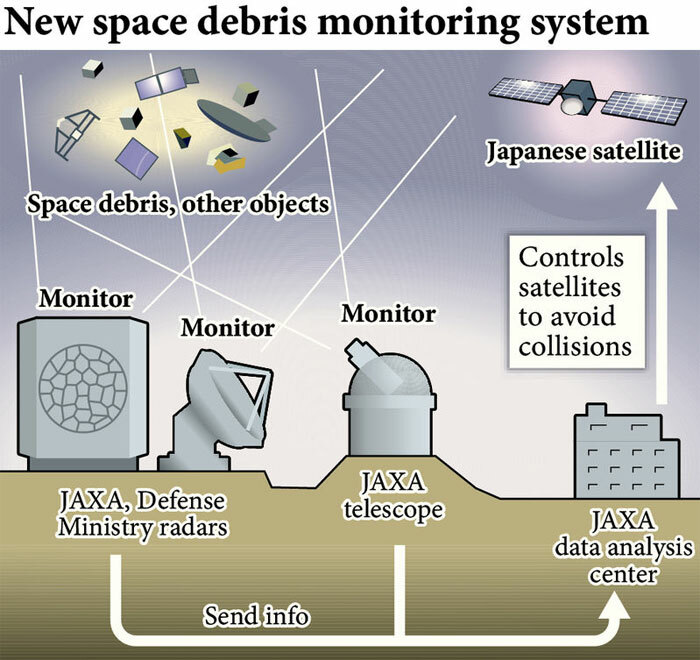 JAXA will work with the Cabinet Office, Defense Ministry and Education, Culture, Sports, Science and Technology Ministry on a project to prevent space debris, which includes satellites no longer in use, from damaging satellites in operation or wreaking havoc on the ground. It will be the first time for Defense Ministry facilities and operations to be used for JAXA’s space observation. The government has been considering using JAXA’s telescope and the Self-Defense Forces’ EPS-5 radar, nicknamed “Gamera radar” for its resemblance to a turtle shell. The volume of space debris has been on the rise as an increasing number of countries have begun space development projects. Currently, JAXA monitors space debris with radar and a telescope set up in Okayama Prefecture. But the system is incapable of detecting objects smaller than one meter in diameter. EPS-5 radar systems are capable of quickly detecting a ballistic missile flying at altitudes of 100 kilometers or higher. The government therefore expects the radar to help improve debris detection capabilities. Under the new monitoring system, data from the telescope and radar will be analyzed by JAXA’s control center. If Japanese satellites are at risk of damage from space debris, moving the satellites or other measures will be taken. The government and JAXA plan to begin discussions on monitoring methods next fiscal year and will work to improve the telescope’s power and resolution levels. Satellites no longer in use, rocket parts used to launch satellites and other objects orbit the Earth. There are at least 16,000 pieces of debris whose orbits are known. Because space debris travels at speeds of about 10 kilometers per second, even objects measuring one millimeter in diameter could cause a satellite to malfunction if a collision occurs. Experts said that if an object measuring 10 centimeters or more in diameter collides with a satellite, the satellite could break up.